Reading Luke 9, specifically one of the accounts where Jesus fed the multitudes (10-17). Jesus took his twelve to a private place that he intended to be just for them, but some people found out, and they sought him out where he was with the twelve. He taught the crowd about the kingdom of God and healed those who were sick. When it was getting late, one of his twelve told Jesus to send the people away so they would have food and lodging. Jesus’ response was, “You give them something to eat.” And then they fed the multitude. Whenever I’ve heard this verse preached, the focus has been on the miracle of Jesus feeding the more than 5,000 people with very little food. When I read it this time, what stuck out to me was Jesus’ response to his disciples: “YOU give them something to eat.” To me, it reveals two important things: what God’s attitude is towards those that follow him, and what ours should be. This crowd didn’t follow after Jesus because they knew that he would give them food; rather because they wanted to hear his words, or at the least, because they knew he would heal them. 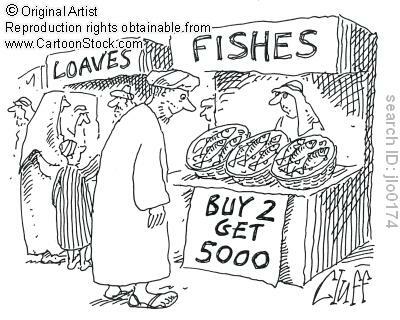 Yet when they had a need for food, for Jesus it was a given: provide for them. This should encourage those of us who are following after Christ. We can be assured that when we seek out the Living Word, that God’s response for our needs will be provision. For him, it’s just a given. In following with the example that Christ provides, as his disciples, we should also be prepared to assist fellow followers in need. It’s clearly what Christ expects of us. “YOU give them something to eat.” I imagine that his disciples who told him to send the crowd home had a look of real surprise on their faces. I don’t think this means to allow people to run over you and try to get what you have, but how much more whole would the body of Christ (those who—like the crowd—are seeking out Christ) be if we were apt to help serve each others’ true needs? Lord, help us comply with what you’ve compelled us to do. Wow, this is a great observation. I never gave that simple word “you” much thought before, but you are right. It was clearly something Christ could have done on his own, yet he commanded his disciples to do this…showing them (and us) that loving your neighbor isn’t just an emotion it’s an action.